Sweden's Migration Agency has forecast that up to 190,000 asylum seekers will arrive in the country this year, more than double the number previously estimated. The agency said an estimated 33,000 unaccompanied children are expected. It said it needs an extra 70 billion Swedish krona ($8.4bn; £5.4bn) over the next two years to cope with arrivals. Separately, more than 12,600 migrants crossed into Slovenia from Croatia on Wednesday, police said. Slovenia, which became a route for migrants after Hungary closed its border, has said it can only manage 2,500 entries per day. Expected accommodation shortfalls in Sweden could see tens of thousands of asylum seekers spend the winter in heated tents. "We have seen pictures of people who are literally walking from Greece across the Balkans to Germany and on to Sweden," Migration Agency head Anders Danielsson said. More than 100,000 asylum seekers have so far arrived in Sweden in 2015, well above the 74,000 previously forecast for the entire year. At a minimum, the agency expects 140,000 asylum seekers in total. Although polls indicate that most Swedes are welcoming of refugees, there have been several recent attacks on centres housing asylum seekers. On Wednesday, Italy sent 70 Eritrean and Syrian asylum seekers to Sweden and Finland under a controversial EU-funded relocation plan designed to ease the burden on frontline countries where migrants arrive. 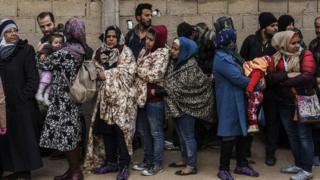 The EU plans to relocate close to 160,000 migrants from Italy and Greece with a compulsory quota system that was opposed by some countries in the bloc. Slovenia, meanwhile, has seen more than 34,000 migrants cross into the country from Croatia since Saturday. Thousands of migrants have been moving through the western Balkans as they try to reach northern Europe amid tough conditions and plunging temperatures. Hungary's closure of its border with Croatia forced migrants to switch to a slower route via Slovenia, a country of two million. Slovenia has accused Croatia of allowing too many migrants to cross into its territory. The EU's migration commissioner is visiting the country on Thursday to discuss its request for financial assistance from the EU and help from other states' police forces. European Commission chief Jean-Claude Juncker has called a special summit of Balkan leaders for Sunday in order to find a better strategy to manage the migrant flows.